“Everything Is Connected: Art and Conspiracy,” now on display at the Met Breuer, explores how for most of the 20th century it was the left that bought into notions of extreme interconnectedness and willfully blurred fact and fiction. Tracing left-wing conspiracy as a visual motif over the last 50 years, this exhibition uses work from artists as disparate as Mike Kelley and Alfredo Jaar to trace the impact of extreme skepticism on America, from John F. Kennedy’s assassination to the 2016 presidential election. Hollein isn’t the only one with these concerns. Jojakim Cortis and Adrian Sonderegger’s “Icons” at Bryce Wolkowitz Gallery captures the artifice of conspiracism by presenting sculptural, photographic reconstructions of famous historical events like the moon landing and the Hindenburg disaster as if they were created by government operatives on miniature soundstages. Fredric Riskin’s “9/11: The Collapse of Conscience,” at Ronald Feldman Gallery, questions the true cause of the World Trade Center’s collapse through doctored photography and skeptical, pseudoscientific observations. Finally, “Fake News and True Love: Fourteen Stories by Robert Baines,” at the Museum of Art and Design, explores the jeweler’s incorporation of conspiracies into the look of rings, necklaces, bracelets, and other objects. Today’s brew of radical conservatism and conspiracism has evidently prompted New York’s cultural institutions to explore the paranoia haunting American politics. But the uncritical promotion of yesterday’s leftist conspiracy theories as today’s entertainment mutes the destabilizing and degrading effects of conspiracy on democracy. Speaking truth to conspiracy should be a moral imperative; these exhibitions revel in art that is more spectacle than substance. It should go without saying that cultural institutions should avoid normalizing conspiracy theories. Still, curators seem to believe there is value in scavenging through the most contested chapters of American history to find plausible alternatives to today’s hard truths. The result is crass and sensationalistic, not thoughtful or subversive. In fact, by turning these imaginary plots into entertainment, they speak to liberals’ worst tendencies: to laugh at, or brush off, ideas from the far right that they find distasteful, instead of reckoning with the threats they represent, and what pushed anyone to embrace such views in the first place. 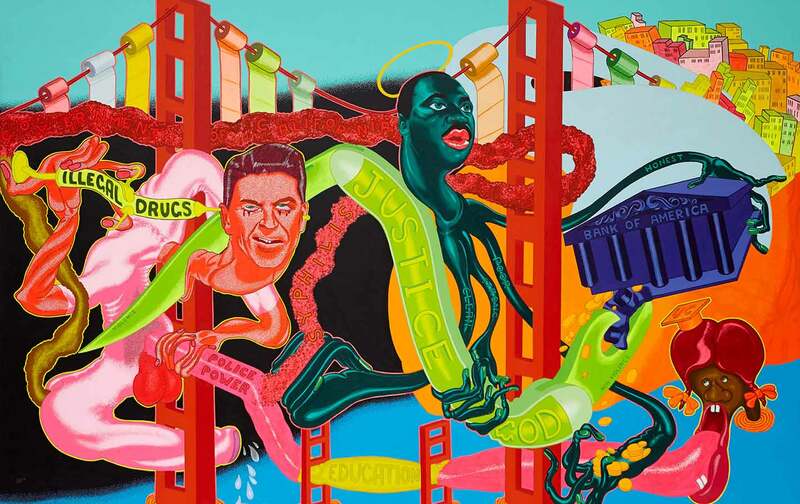 Take Peter Saul’s Government of California (1969), the exhibition catalogue’s cover image for “Everything Is Connected.” The work is a neon-painted mishmash of discontent articulated through an acid trip: an octopus Martin Luther King Jr. massages the phallus of Justice oozing from the banking system, as a spectral Ronald Reagan—then governor of the Golden State—directly injects drugs into his cranium. Visually entrancing, Saul’s work is an excellent representation of disaffection in the Vietnam War era. But its placement in the first half of the show, which is intended to gather artists who take an investigative approach to their work, doesn’t do it justice: Situating Saul’s work alongside AIDS activism agitprop and Black Panthers ephemera makes it seem like the curators regard it as a documentary record rather than an angsty, expressionistic swirl of Day-Glo paint. Nearby, too, are works by Jenny Holzer, Hans Haacke, and Mark Lombardi—a suite of artists who hew closely to public records to make their claims. As proponents of a documentarian approach, these artists investigate conspiracy with a judicious detachment that separates them from artists like Saul who would rather revel in the passions of discontent. It’s a shame the rest of the exhibition lacks such measured approaches. Holzer, for instance, appropriates text and format directly from declassified government documents to create her 9/11-related objects. Haacke, meanwhile, meticulously documents the prevalence of slumlords in 1970s New York through the visual curation of publicly accessible data. Lombardi creates a vast flow chart of shady financial transactions between governments, corporations, and criminals. These artists are less interested in celebrating conspiracy theories and more concerned with unveiling the illicit activities of power brokers. The best section of a show about conspiracy happens to be the part that dutifully avoids the label. Saul told The Huffington Post last year he tries “to vote as left as I can…. I hope that my paintings will coincide and be far left, but frequently…the painting rebels and goes fascist on me.” This is what happens to his work in “Everything Is Connected,” which evades responsibility in favor of complicity and equivocation. Conspiratorial thinking subsequently emerges as a paradoxical end to its own means, perpetuating a cycle of shock and resentment, and it becomes the single remaining interest that unites both ends of the political spectrum. Why is that? In the context of this exhibition, mixing documentary evidence with artistic interpretation helps mollify the viewer toward conspiracy. This strategy becomes even more troubling in the second half of the exhibition, where curators have presented Jim Shaw’s Martian Portraits (1978) in the same room as John Miller’s Wheel of Fortune homage to the anti-Semitic theory of the Zionist Occupation Government and Sue Williams’s controversial neon abstractions that glorify the notion that the September 11 attacks were an inside job. Not all conspiracy theories were created equal, of course, which makes it all the more worrying for the show to juxtapose these three artworks (whether intended as satire or not) with the very real existence of government-sanctioned torture and money laundering. In doing so, the show’s curators provide little critical context to the art on display. For an institution with a nearly 150-year history of avoiding explicit commentary on current events, “Everything Is Connected” feels like a misstep. The organizers of “Everything Is Connected” did foresee one potential minefield: the 17th anniversary of 9/11, or Christmas for conspiracy theorists. To avoid unsavory entanglements, perhaps, the Met opened its exhibition a week after the commemoration—but the Ronald Feldman Gallery in SoHo did not exhibit such restraint, and launched Fredric Riskin’s “9/11: The Collapse of Conscience” that same day. In his new show, Riskin, a conceptual artist using mixed media, presents a series of panels consisting of documentary photographs and texts. Many of those images depict the collapse of the World Trade Center, which Riskin transforms into a grainy, aesthetic homage to surveillance photography. Riskin’s goal seems to be clarity, but he more often obfuscates truth with Islamophobic commentary and already-debunked myths about who perpetrated 9/11. He describes the Muslim pilgrimage to the Kaaba as a gravitational “massive psychic density” and the aftermath of September 11 as an “activated tension field” (whatever that might mean). In particular, one panel wonders why the Twin Towers collapsed upon themselves instead of snapping apart like a tree struck by lightning, which would be the “path of least resistance,” according to the artist. 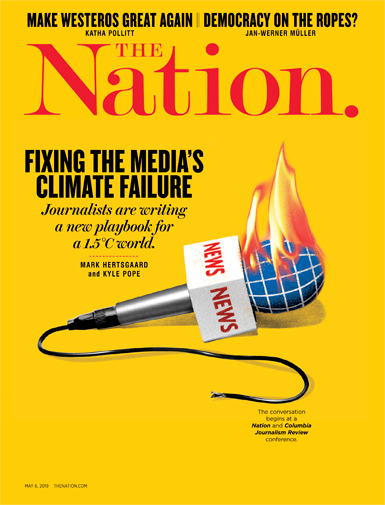 Riskin even cites Newton’s Second Law, which explains how the velocity of an object changes when subjected to an external force, to claim that the Towers’ collapse was unnatural and likely prompted by something other than the plane crashes. This poetically presented suspicion baldly ignores the available evidence, produced by MIT’s Civil Engineering Department less than a month after the attack. That research describes how the ignited jet fuel leaking out of the crashed airplanes became hot enough to weaken the steel support beams until they bent under pressure, forcing each subsequent floor to collapse like a column of vertiginous dominoes. The omission, in today’s context, comes off as purposefully irresponsible. That may be the case. Unfortunately, the “healing” Riskin and other conspiracy theorists pursue is lost when such nuance overwhelms evidence, when their pursuit of the “real” devolves into vengeful incoherence. The distinction that these exhibitions make between left-wing and right-wing conspiracy theories is unproductive, because it avoids reckoning with what produces them in the first place. Cultural institutions have thus tried to capitalize on our discontent, legitimizing conspiracy as an acceptable tool for political organizing and whetting their audience’s appetite for distrust, disdain, and disaffection. Zachary SmallZachary Small is a staff writer at Hyperallergic. They have previously written for publications like The Financial Times, The Times Literary Supplement, and Artforum.